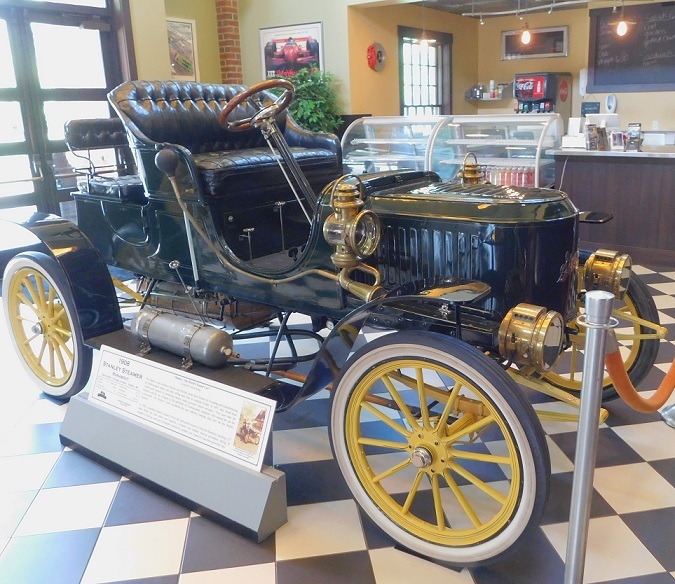 We recently visited one of the best car museums anywhere in the world. It is the Gilmore Museum, located in Hickory Corners, Michigan. It is not far from Battle Creek or Kalamazoo, Michigan. 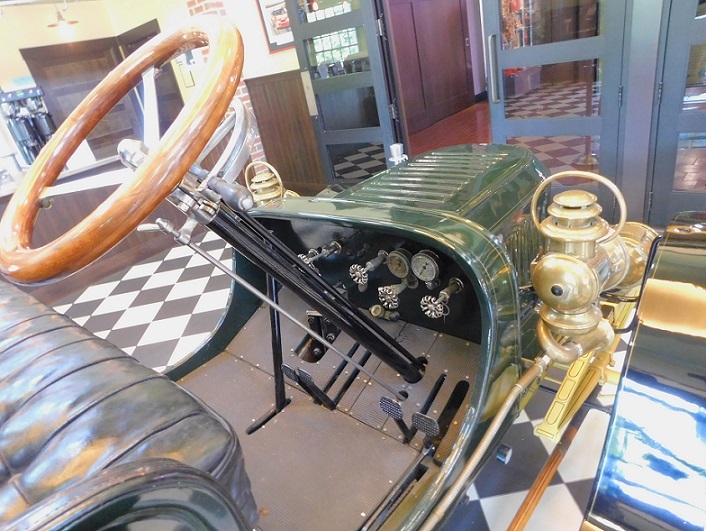 A lovely 1908 Stanley sits in front of one of the restaurants inside the Gilmore Museum. With over 300 cars on display and 300 other cars and trucks kept in storage for rotation on site, this is a massive facility. 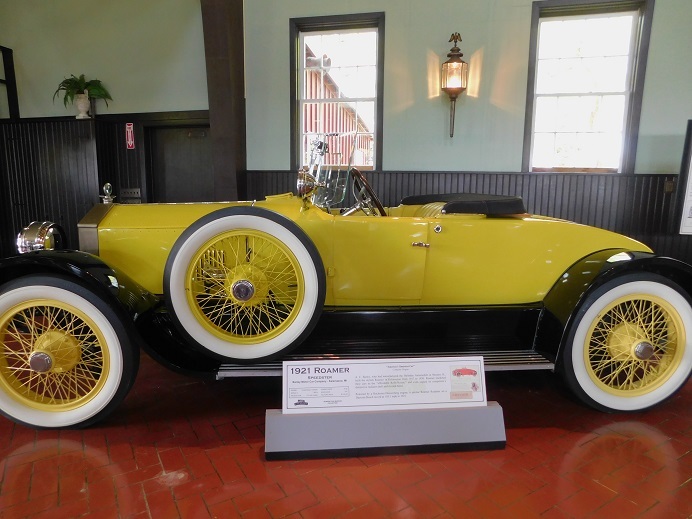 Marque museums are operated and cared for by the Model A Restorer’s Club (MARC), the Classic Car Club of America (CCCA) the Pierce Arrow Society, the H.H. Franklin Club, and others. The grounds encompass some hundreds of acres. There are multiple buildings, each devoted to a theme. Let’s take a look at a few of the wonderful things in this first class collection. I can’t even come close to showing all of the buildings or all of the automobiles. We will look at a few of my favorites. I’ve always thought the controls in Stanley automobiles were quite complicated. That, combined with their reputation for frequently catching on fire, is part of the reason I have never owned one. 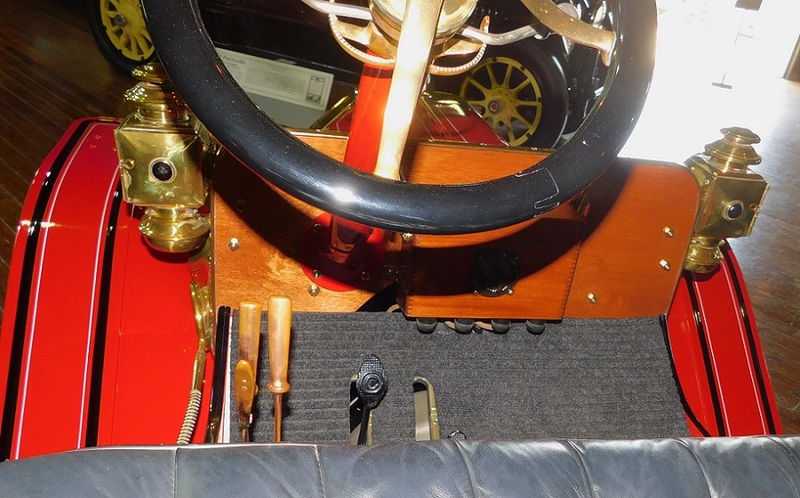 Look at all the valves, pedals and dials in the 1908 runabout’s interior! 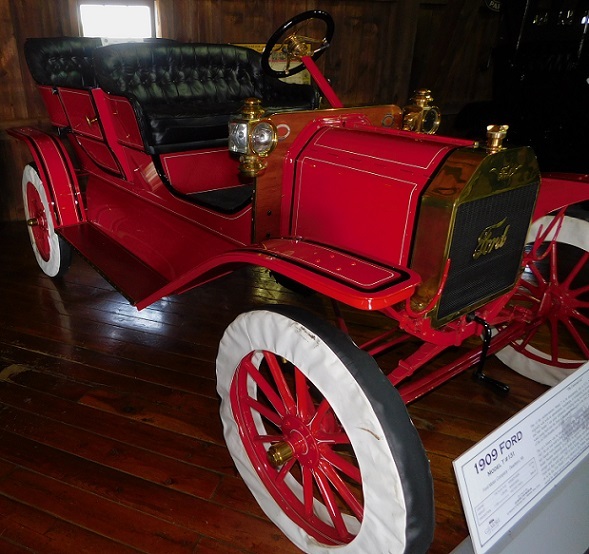 When new the 1908 Stanley sold for about $1300, compared to a Model T Ford at $1000. The Stanley was faster than a Model T, but much more trouble to maintain and not as reliable. A bird’s eye view of the Gilmore shows some of the many buildings. Not shown are the similar sized facilities across the road where cars that are not on display are stored! 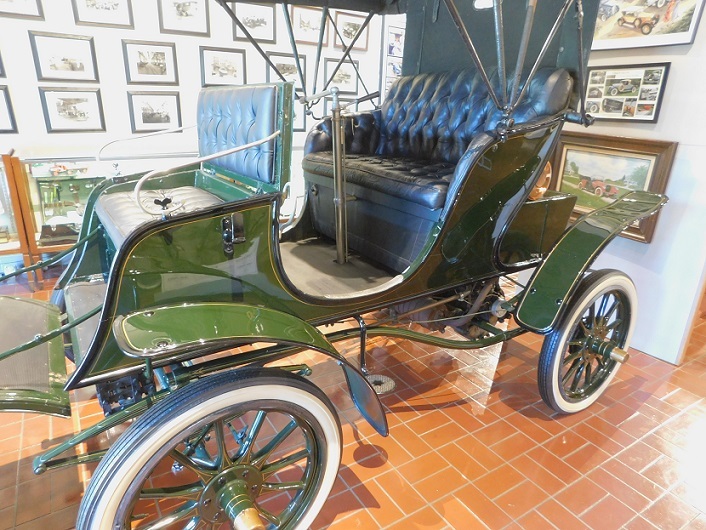 A 1903 Pierce Stanhope sits in the entryway to the Pierce Arrow Society building. 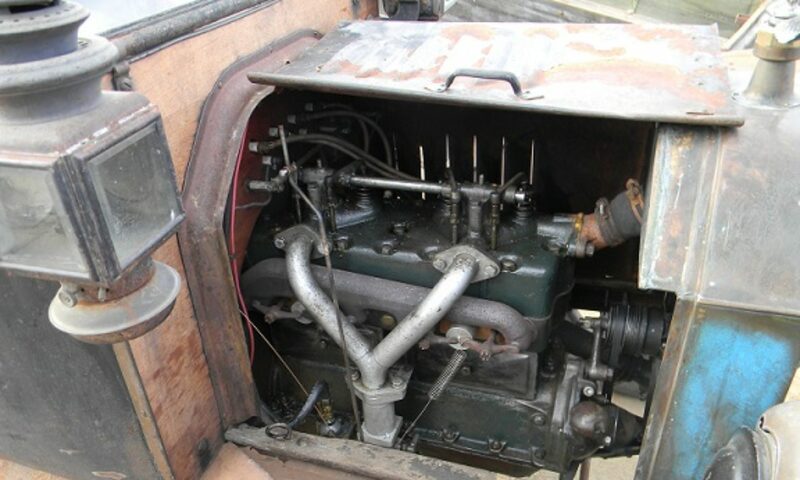 The early Pierces used a license built (French designed but manufactured by Pierce) DeDion Bouton single cylinder engine of 6 1/2 horsepower. The George N. Pierce Company built bicycles, birdcages, iceboxes, and even bathtubs along with automobiles. The Stanhope was the four passenger version of the Pierce Motorette. Controls were simple, with a two speed planetary transmission, throttle, spark and brake. 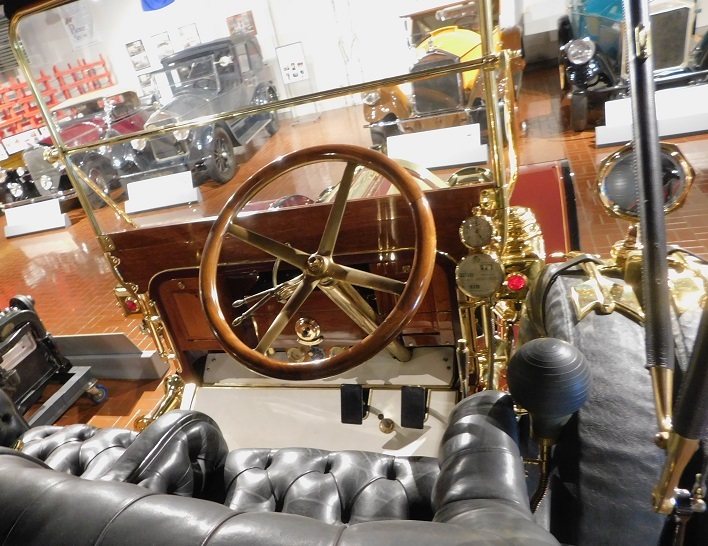 Pierce introduced a steering wheel to replace the tiller during 1903. 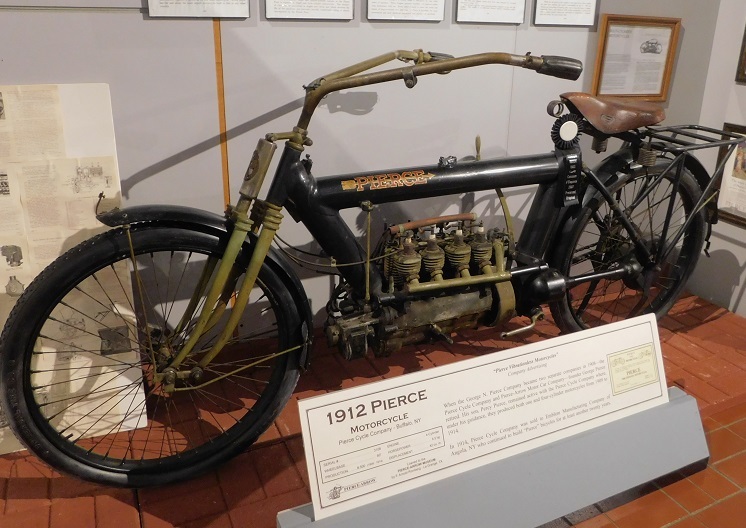 Pierce built some of the fastest motorcycles available in 1912, with this four cylinder model occupying top of the line. Quality, as with all Pierce products, was second to none. 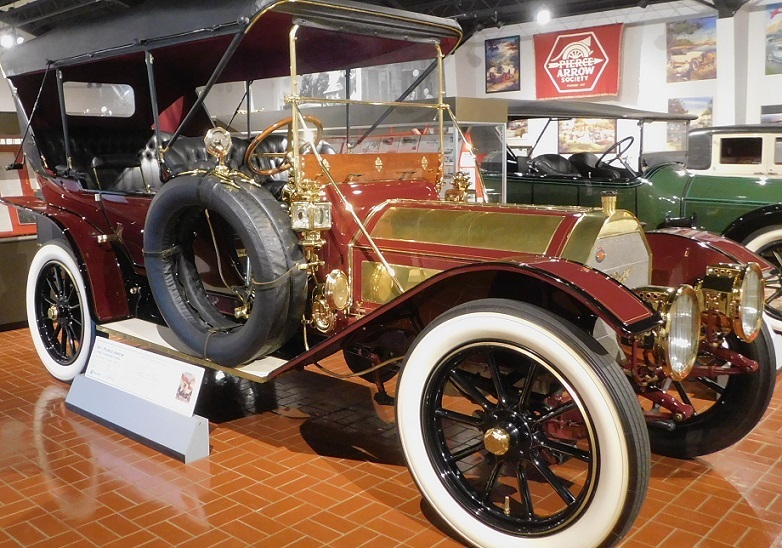 Huge 1909 Pierce 48 HP touring was not the biggest Pierce that year, but it certainly is impressive today. With a solid brass hood, brass trim everywhere, and massive size you need to set aside a solid 40 hour week for polishing. Pierce six cylinder T head engines were huge, reliable as death and taxes. 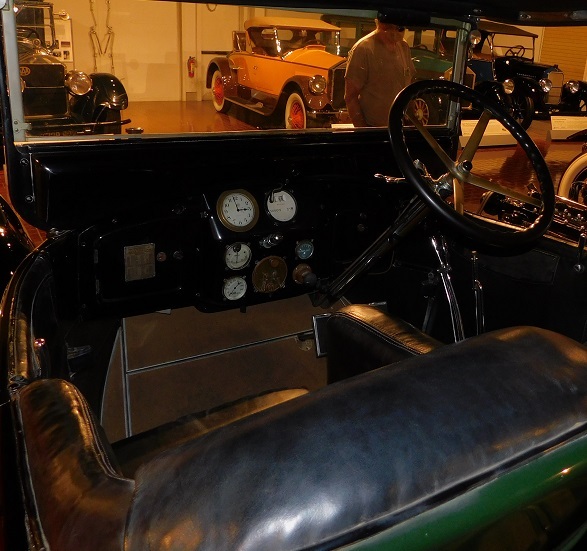 The Pierce interior was plush and the controls simple for the very wealthy individual who could afford one. One needed to have a permanent staff member to polish the brass between drives. 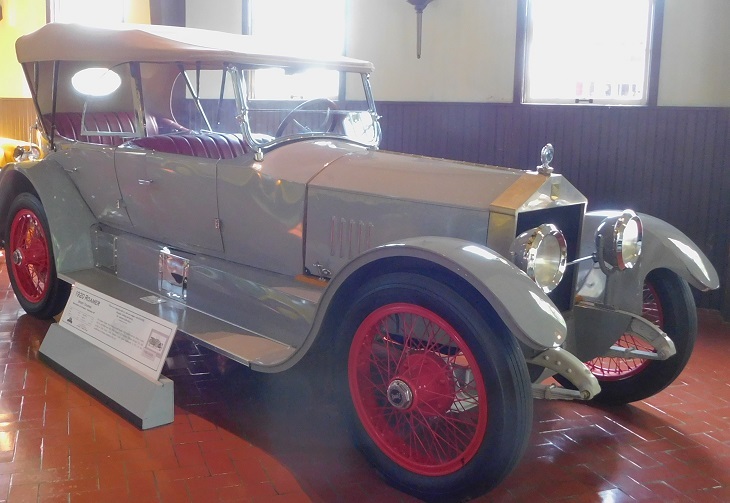 Pierce Arrow’s trademark fender mounted headlamps did not appear on all cars, even though they were standard from 1913 onward. 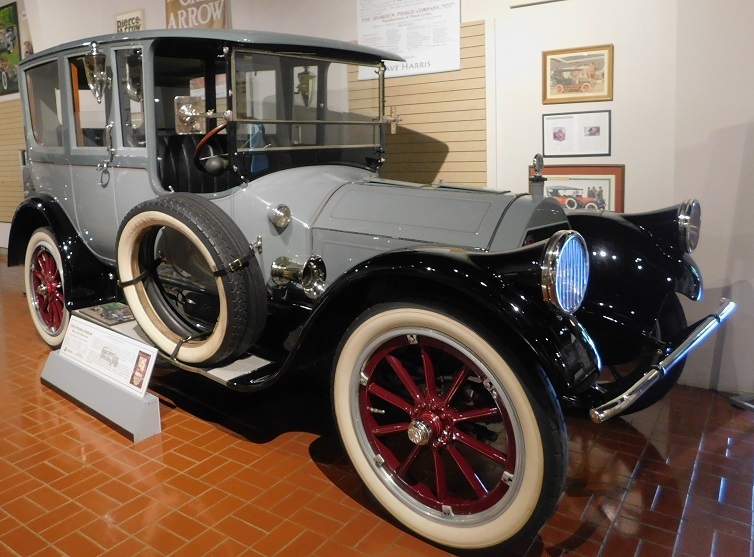 This 1915 Pierce Arrow touring is a 38 horsepower example, still twice the size and ten times the price of a Model T Ford! This car’s original owner opted for conventional headlamps mounted to the frame, an extra cost option on an already very expensive car. 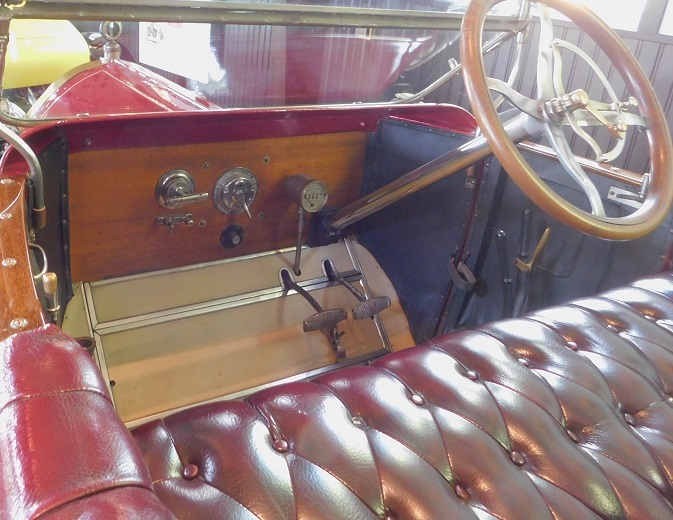 The 1915 Pierce Arrow interior was now more refined than the earlier cars, with built in glove boxes for both driver and passenger. The Pierce came standard with both high tension magneto and battery ignition. Transmission was a sliding gear three speed. Notice the floor boards which are trimmed in aluminum and covered with linoleum. Pierce continued to have the driver sit on the RH side until well after WWI, and was one of the last US manufacturers to embrace the practice. Pierce won a large contract from the United States Army in 1918 for 5 ton trucks. Hundreds were built and shipped to Europe to participate in World War I. 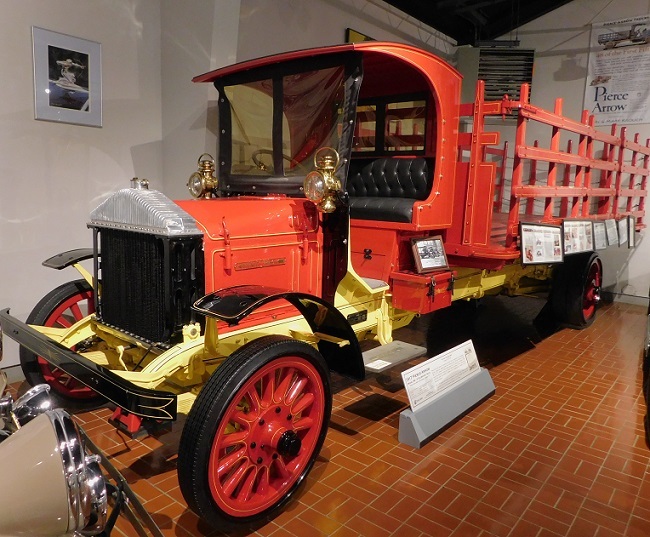 This example of a 1917 Pierce 5 ton truck was a civilian model, and is a massive machine indeed. More of these trucks exist in Europe than in the USA today. 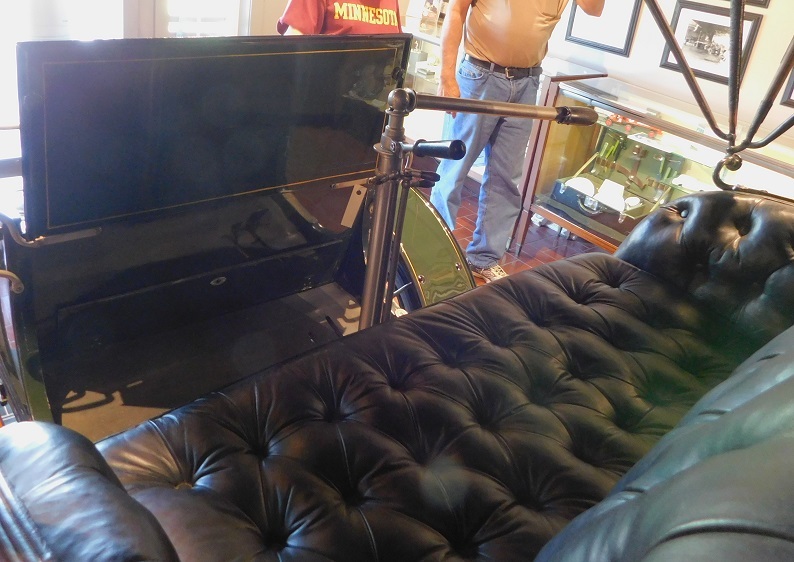 This 1918 Pierce limousine was a full custom body built on the small (????) 38 horsepower chassis. 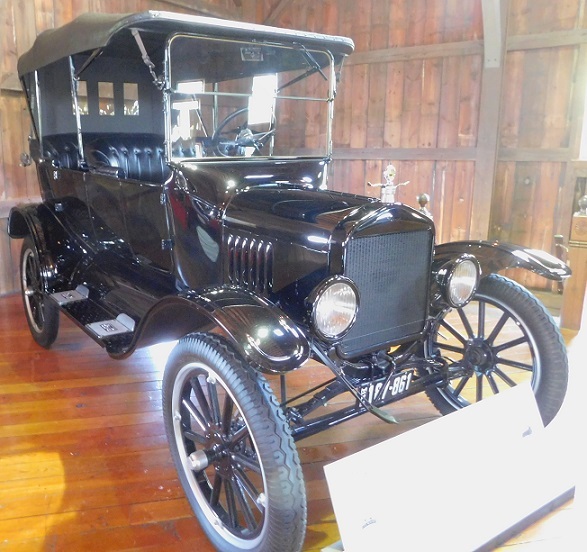 This car cost over $7000 new at a time when a Model T Ford town car cost only $700. 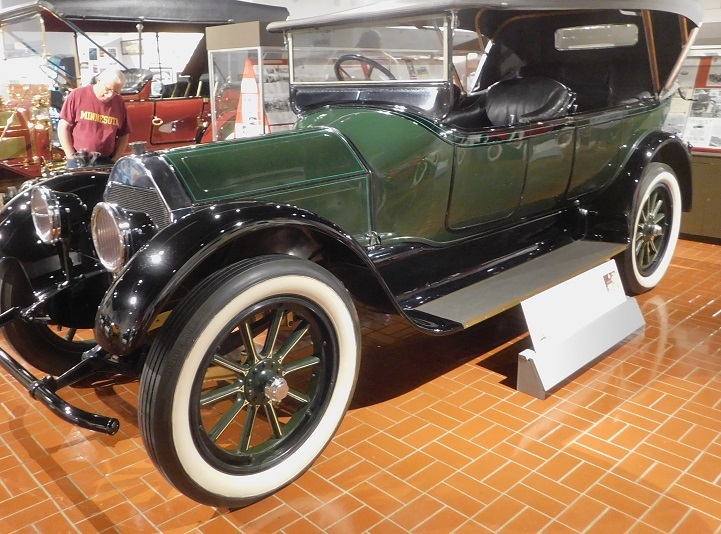 Notice this car has the traditional fender mounted headlamps that graced most Pierce Arrow models from 1913 – the end of production in 1938. United States presidents used Pierce Arrow automobiles from 1910 until the company went out of business in 1938. 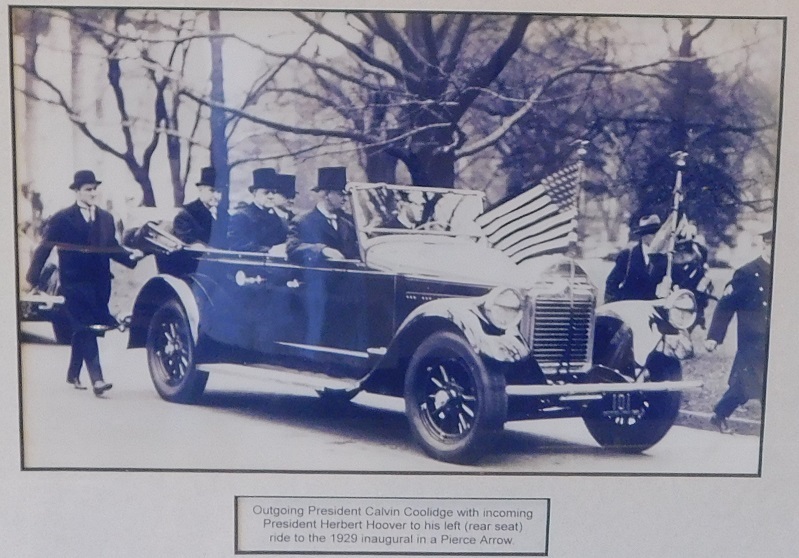 The car above is a 1924 Model 33 nine passenger touring used by presidents Coolidge and Hoover. An entire building at the Gilmore houses only cars built in Kalamazoo, Michigan which is just up the road. One of the more successful makes was the Michigan. 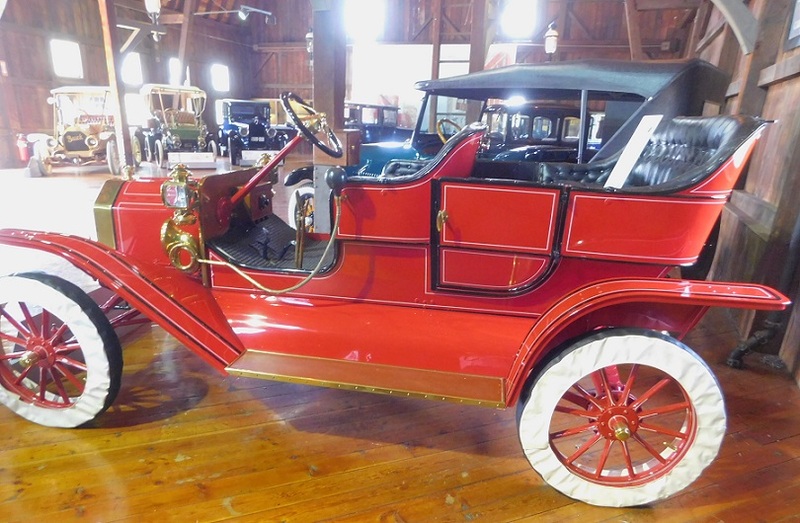 This is a 1903 Michigan, the first year of production. 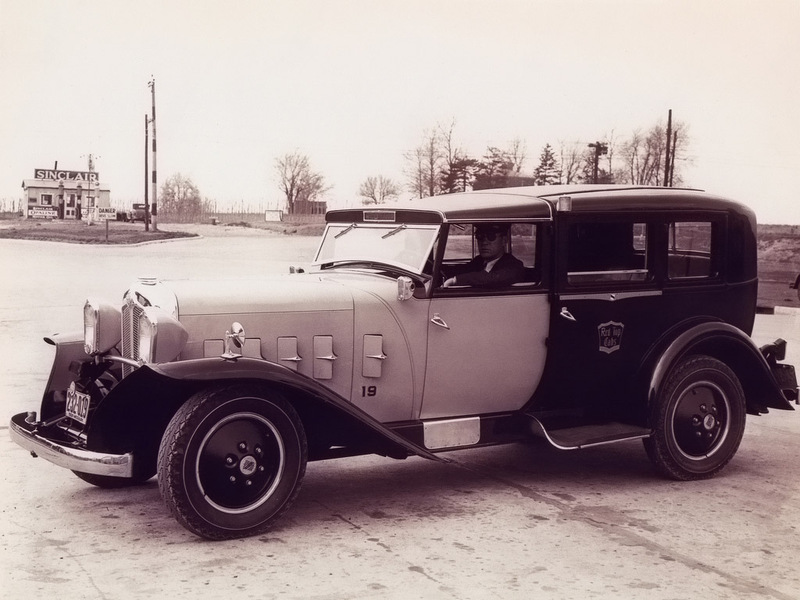 This car was the result of a partnership between two sets of brothers, Charles D. (Chairman) and Frank D Flood (General Manager), and Maurice E. Blood (Treasurer), and Charles C. Blood (Superintendent). The cars built in 1903 were viewed as successful, but the partners never quite got along. By 1904 the Flood brothers had gone their separate way, and started producing identical cars in Kalamazoo as Flood automobiles! This confusing situation carried on for a few years until all went out of business after 1906. Above, a 1912 Mighty Michigan touring. The controls of the Mighty Michigan. Close to 7000 were built from 1911 – 1914. 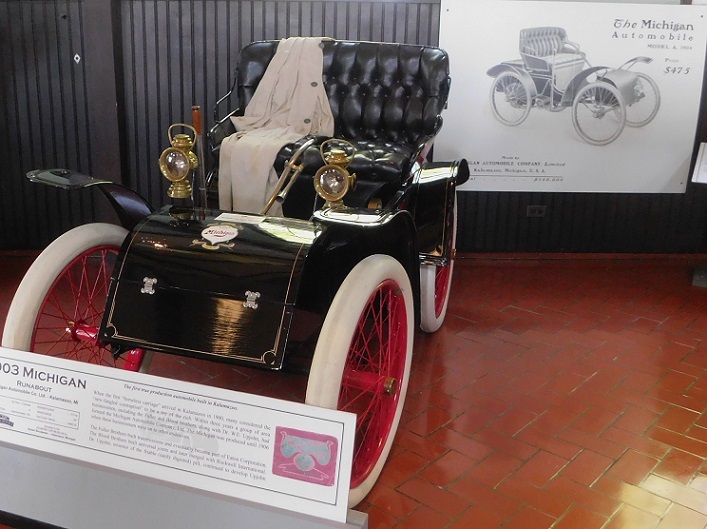 The second automobile to bear the Michigan name plate arrived on the market in late 1911 as a 1912 model. 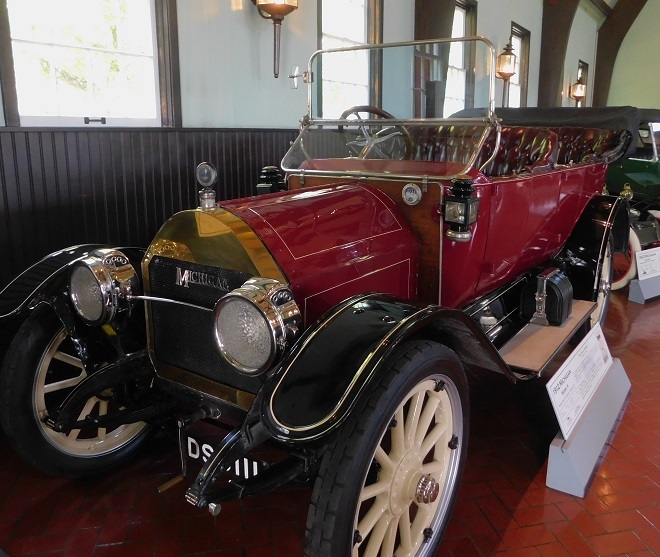 Universally respected for high quality and good engineering, the “Mighty” Michigan automobile was built in Kalamazoo by the Michigan carriage works. The firm collapsed amid lawsuits, allegations of involvement in a prostitution ring, and other scandalous accusations between partners Victor Palmer and Frank Lay. Eventually Palmer went to prison while Lay became embroiled in legal troubles that bankrupted his business in 1914. 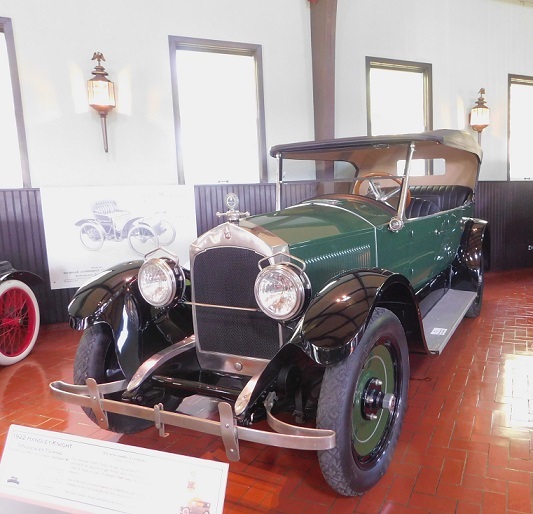 The factory was first acquired by State Auto Company in 1914, then by the Barley Motor Car Company which built the Barley, Pennant and Roamer automobiles from 1916 – 1929. The Roamer automobile was a luxurious upper class car that stole most of its styling cues from contemporary Rolls Royce, unabashedly so. Most Roamers, like this one, had Continental four cylinder engines rated at 50 HP. There were also Roamers with optional Rochester-Duesenberg engines rated at 75 horsepower that were quite successful in racing competition. 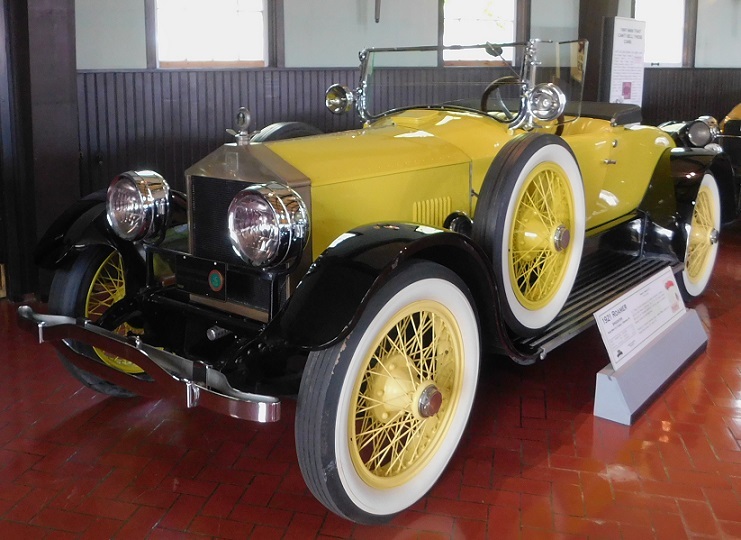 Lovely 1921 Roamer roadster has the optional 75 horsepower Rochester Duesenberg “walking beam” four cylinder engine. This was a phenomenal car for the era. Impressive from any angle, the Duesenberg powered Roamer is a recognized full CCCA Classic. The Handley automobile company was a short lived Kalamazoo enterprise from 1921 – 1924. The touring above is a 1922 model, one of few built and fewer known to exist today. The company slogan “If it carries handles, it’s a Handley” refers to the loops on each headlamp which ostensibly helped the cars to be recognized. 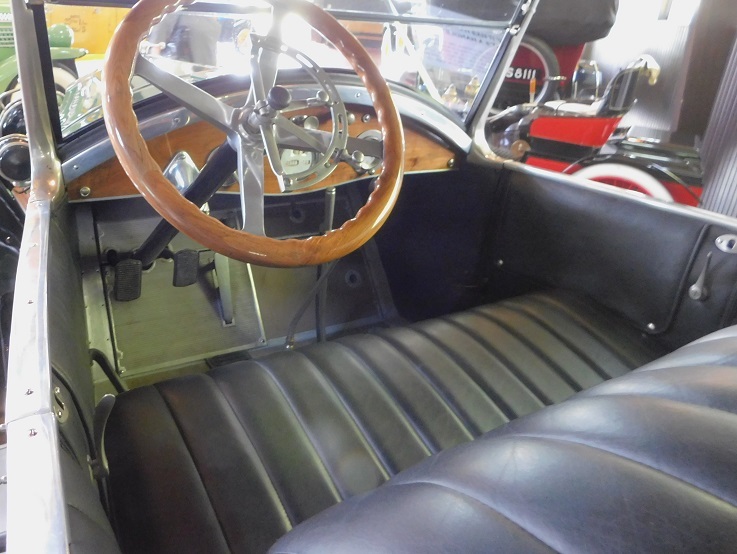 The Handley Knight had a nice interior, with controls similar to a Model A Ford of ten years later. The sleeve valve engine was used from 1921 – early 1923. After that a few cars were built using Falls and Buda engines to use up parts on hand. In 1924 the Checker automobile company bought the Kalamazoo Michigan Handley operations and facilities. 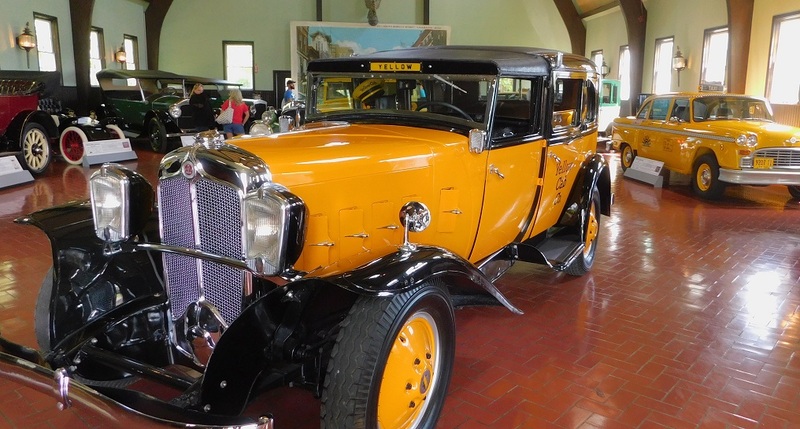 The Checker Cab Company built its own vehicles from 1922 until the demise of Checker brand cabs and the Kalamazoo factory in 1982. The car above is a 1931 Checker Model M, which certainly had the Art Deco styling of the era. These were cars designed to be taxi cabs. Gearing was made for city driving so that a tiny flathead four engine of 25 horsepower supplied by Continental could carry the taxi and its driver with up to six passengers in the rear compartment. Above, the Checker was made with an elongated passenger compartment that could swallow 6 passengers with luggage easily. In the loft of one of the many buildings at the Gilmore is Model T Ford serial number 131. This is a two lever, water pump equipped Model T, one of the earliest known to exist today. The tires are covered by some silly looking vinyl covers intended to reduce the graying effect of sunlight on the tires. This loft is bathed in sunlight from several directions making photography challenging. 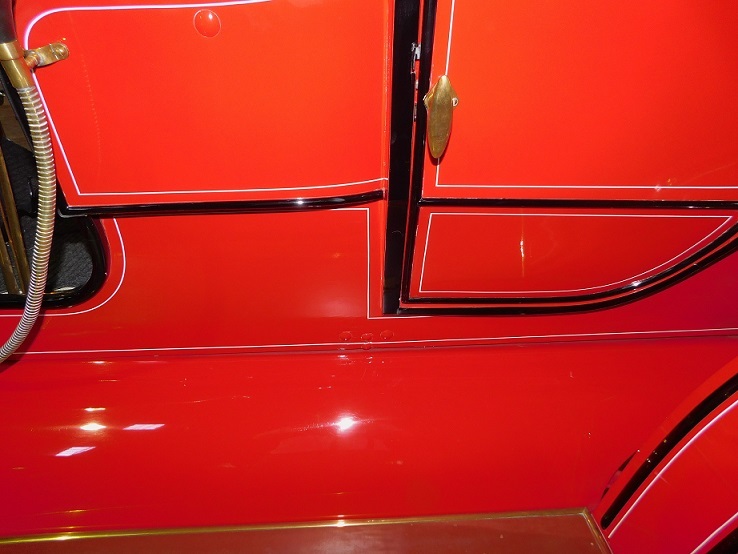 Note the linoleum covered wooden running boards with brass edge trim, a feature discontinued after the first 2499 Model T’s. 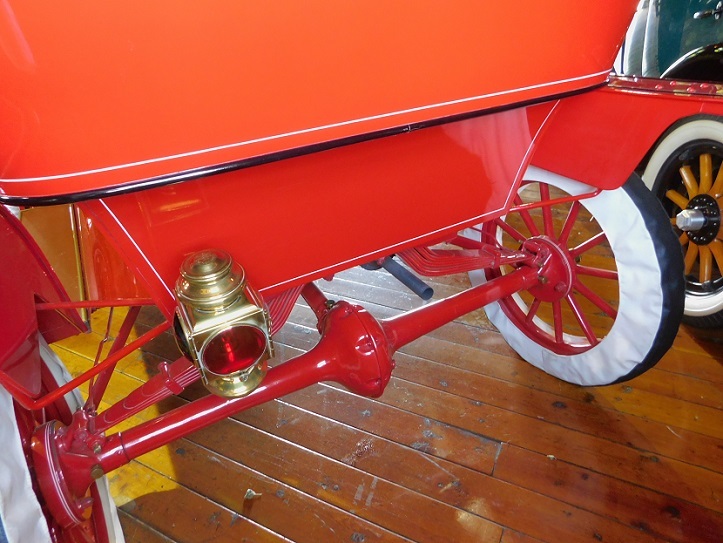 The rear body brackets on the first 2499 Model T’s had four bolts as seen here. The fragile “no rivet” 1909 rear axle assembly as used on the first 10,000 cars approximately. Notice there is not a pinion bearing housing, the driveshaft was supported at each end by a babbitt bushing. The car was purchased with no options, and remains that way today. As such it does not have headlamps, a windshield, or a top. Controls in the first 700 Model T’s consisted of two pedals, two levers, the mixture control, steering wheel, spark and gas levers. 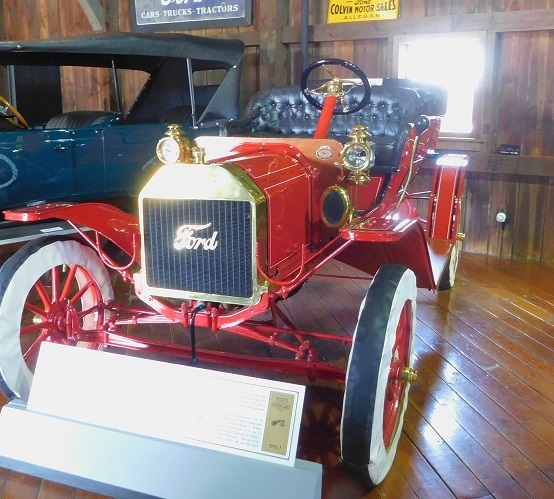 This 1921 Model T Ford touring was the recipient of a fine quality restoration. This is the car most people think of when they imagine what a Model T should look like. The 1921 sits adjacent to the 1909 and holds its own among visitors.